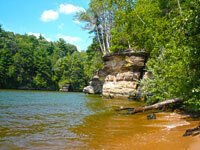 Lake Aire Motel in Wisconsin Dells puts you in the center of all the thrills, rides and major attractions of the Dells. Lake Aire Motel is located next to Tommy Bartlett’s Water World and Exploratory on the Wisconsin Dells Parkway and is a comfy place to stay while you explore the countless amusements of Wisconsin Dells. The rooms are clean and come in various sizes, some with kitchen facilities; all have free Wi-Fi, cable TV and free coffee. There is a heated outdoor pool, playground and game room at the Lake Aire Motel and with the added benefit of its prime Wisconsin Dells Parkway location, it’s a good choice for convenience and value.